There’s nothing better than a road trip, unless it’s an emission-free road trip where you break a record. A group of students from the University of British Columbia are attempting to set a record for the fastest coast-to-coast drive across Canada in an electric vehicle – in this case, an electrified classic Volkswagen Beetle. 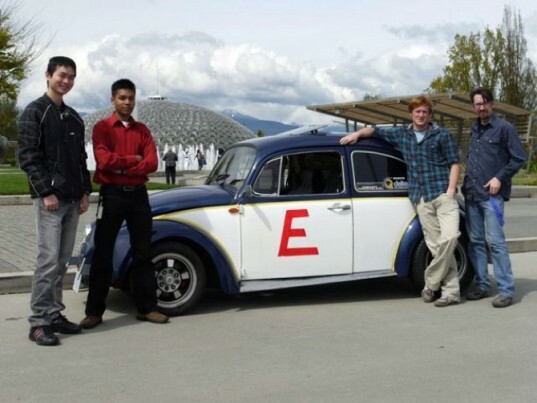 In an adventure that could easily be dubbed “Herbie Does Canada”, the group of students left Vancouver last week hoping to make the 4,000 mile journey in their electrified 1972 Vee Dub E-Beetle. The car was converted by the UBC Electric Car Club to run on electricity — it features a three-phase AC induction motor hooked up to a lithium iron phosphate battery. With the new modifications, the Beetle is capable of traveling 185 miles at 60 mph and over 340 miles at 30 mph. As such, the team walks a fine line between a decent driving speed and making sure the battery didn’t go flat — especially considering that it takes four hours to recharge the battery. Impressively, the E-Beetle is capable of reaching a top speed of 85 mph and boasts four wheel discs with regenerative braking. As someone who has driven through Canada before, I can attest that the team could not have found a more beautiful and naturally challenging environment to push their E-Beetle to the limits. Due to the country’s wide-ranging array of terrains, any normal road trip would need careful planning, and this is even more true for the E-Beetle. As such, the trip has been planned with places to charge the car decided beforehand. So far, the team has made it up to the summit of the steep Coquihalla Highway, so if you’re a Canadian Inhabitat reader, be sure to check out their progress and if you see them, wish them luck. The team is keeping a blog of their progress, which can be read here. The Volkswagen Beetle has been the unofficial icon of the University of B.C.’s engineering department for almost 30 years, and the iconic car has been utilized in a series of pranks. Previously, the car has been planted in Lost Lagoon, hung from the university’s Ladner Clock Tower and the Lions Gate Bridge, placed in the George Massey Tunnel (the PNE’s roller coaster), and left on San Francisco’s Golden Gate bridge. There's nothing better than a road trip, unless it's an emission-free road trip where you break a record. 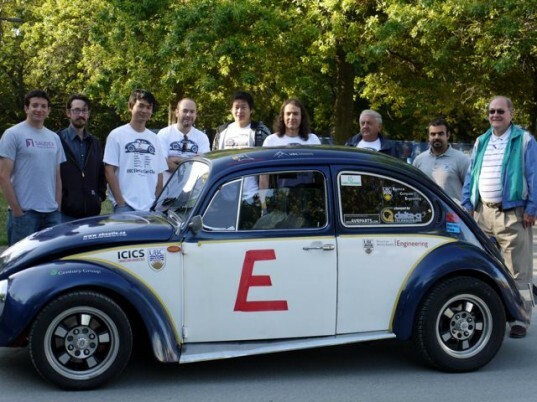 A group of students from the University of British Columbia are attempting to set a record for the fastest coast-to-coast drive across Canada in an electric vehicle - in this case, an electrified classic Volkswagen Beetle.